Of course, today is Sunday, so we can't call Escape.... we are trying to hitch up our 17A to our Tacoma and we just can't seem to get the hitch to lock down in place. This happens to me too sometimes and I have found that by letting the tongue / ball support full weight … then putting tow V in gear and "jerking" forward and back a few times will help to get the coupler to settle down. 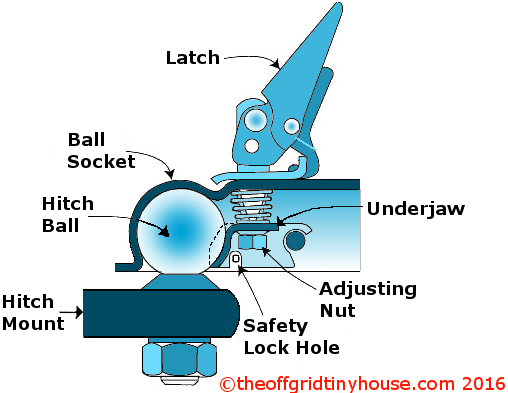 Alternatively, have jack support full weight and toggle the locking lever to make sure its free. With the ball as far forward in the coupler as you can get it, lower the jack till the ball sits home in the coupler. The locking lever controls what is almost like a fork that surrounds and locks the neck of the ball into the coupler and sometimes I seem to get that "fork" pinched and then it wont lock. Another idea: Have you greased your ball? Thank you for your quick response - we will try your suggestions - as of course, we are all packed and ready to go..... frustrating! There is an adjustment for the coupler that might be too tight. Also be sure the latch mechanism isn't stuck above the ball. It happens. Make sure you have a little grease on the ball and up on the curved part of the front of the coupler. Then make the couple just barely crawl over the ball. That will put the ball to the front of the coupler letting the clamping part of the yoke fit up under the back side of the ball. Don’t get too happy loosening that adjusting nut, you might check it for tightness when you’re done getting it all seated just so it can’t hop off the ball. On you can crank the jack down and watch the crank try to lift the back of the tow vehicle, you’ll know it’s secure that way too. Same advice as in the other post but in farm vernacular. Sorry you’re having a little delay. Sorry …. and understand the frustration. Is your ball the right size? Should be 2". With coupling jacked up and hoovering above ball, make sure that the locking collar is lifted and all the way back toward the rear of the trailer …. checking alignment, lower jack foot until ball is in coupling …. if it still hasn't seated and if you are on level ground, pull ahead at very slow speed and then slam on the brakes. Expect to hear a loud clank as it seats home. Jack foot should be high enough so it doesn't drag on ground. Most likely, the locking collar hasn't been pulled up and pushed back enough to open the coupler. When in proper position, there are a couple square teeth that will fit into slots and hold the coupler open for mating. After mating be sure to 'slide' locking collar back forward and down to lock. Be patient … you will get it. My trailer is a 1000 miles away or I'd go out and take pictures for you. Perhaps someone can help in this regard? Dusty, is your coupler actually like that? While the image shows a common design of coupler, Escape normally uses a yoke-style coupler which works very differently and does not require or have an adjustment. In the yoke-style coupler the jaw (or "fork") need to be pulled fully back (by lifting and pulling the yoke which wraps around the front) to provide a clear space for the ball to go up into the coupler socket. If the jaw is not out of the way, you can have the coupler sitting on top of the ball. Dusty, is the ball going all the way into the coupler? Without sticking your fingers in there (pinch hazard! ), have a look and see if the ball is all the way in, and if the jaw is moving forward to latch. As the other posts have suggested, once the coupler is properly down over the ball, the usual problem is getting the ball forward in the coupler socket so that the jaw can more forward enough to completely latch. This is why people suggest pulling forward with the tug, or letting the trailer move back. That eTrailer listing shows the jaw underneath in open and closed positions. I've had this problem numerous times with my Scamp. The hitch mechanism was 'jammed' to the back of the ball. Taking the truck out of gear (and releasing the parking brake) and letting it roll forward a minuscule amount was all it would take to get a positive latch on the ball. Good luck!